We were commissioned to create a 10’ X 24’ image for use in a promotional spot for Ink Master, Spike TV’s longest running show. We worked on the piece in direct collaboration with Director, Steve Fuller and Show Host Dave Navarro. After its completion, the Spike team requested and purchased additional usage rights to prominently feature the piece throughout all of the promotional materials to launch this year’s show. Installed inside The Common House in Charlottesville, VA, the piece explores how gender roles are changing in popular culture. The concept behind Change Things, was to transform an overtly masculine comic book icon (Thing) into a portrait and ultimately, a celebration of, an equally stereotypical female cartoon/comic culture icon—Cinderella. Curated project pairing 20 visual artists with 20 world renowned guitar players. ASVP was paired with legendary Cheap Trick guitarist, Rick Nielsen. 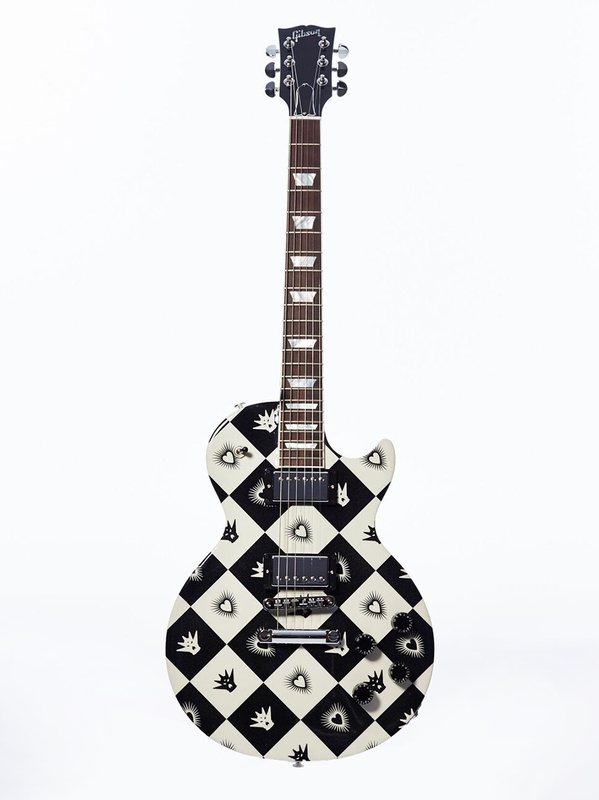 The Les Paul, provided by Gibson USA, was painted as an ode to Nielsen’s love of skulls and checkers on his guitars and clothing throughout his career. 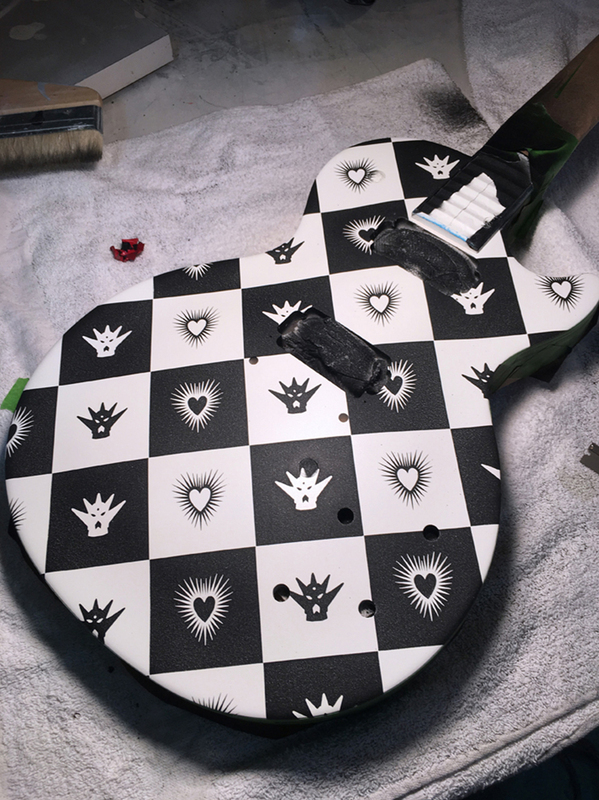 The completed ASVP Les Paul was recently signed and played to a Cheap Trick crowd of 10,000 at Jones Beach Theater. The piece is currently scheduled to be auctioned off this coming fall to raise money for VH1 Save the Music Foundation, in support of musical education programs in public schools. 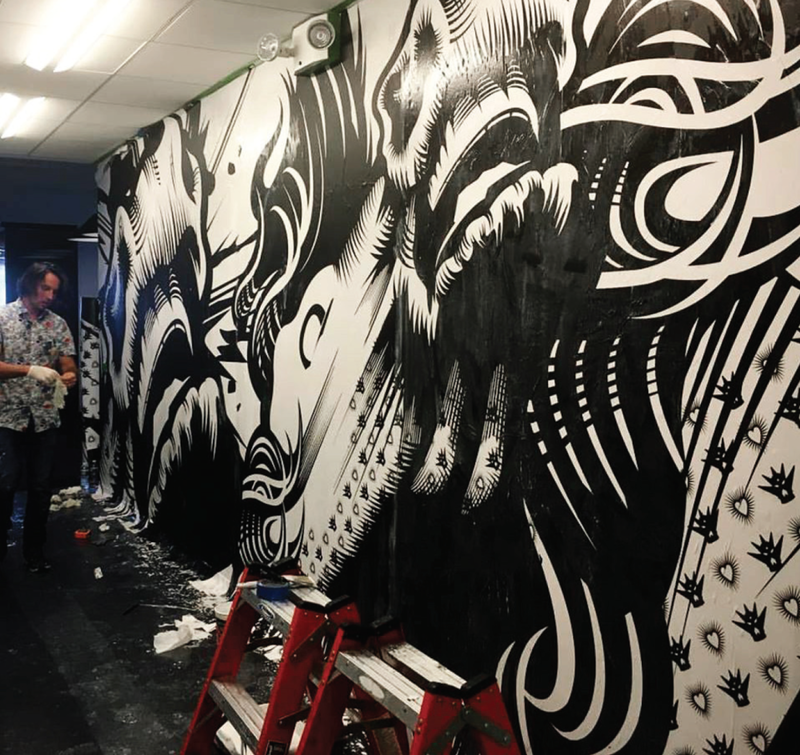 Design commission to create 80’ long wheat pasted mural in McCann Ericson’s New York City headquarters. With a limited budget, timeline and onsite access limitations, we proposed producing a b&w, digitally printed, collage of our existing original illustrations to successfully produce and install the project on time and on budget. The Big Egg Hunt, a curated Public Art Project was a city-wide Easter Egg Sculpture Hunt which culminated with the group of pieces being displayed at Rockefeller Plaza then sold at auction. All proceeds from the auction benefitted two non-profits; Studio in a School and Elephant Family, which focuses on elephant conservation and combatting the adverse effects of the ivory trade. Mural commission for a curated / invitation only, takeover of the soon-to be redeveloped 21st Police precinct in the Lower East Side of Manhattan. The title of the piece “Ton of Bricks” made reference to the looming demolition of the building down to its individual bricks as well as the actual wall on which we pasted our image. Design commission to create 25 murals for Spotify’s North American headquarters, in New York City. 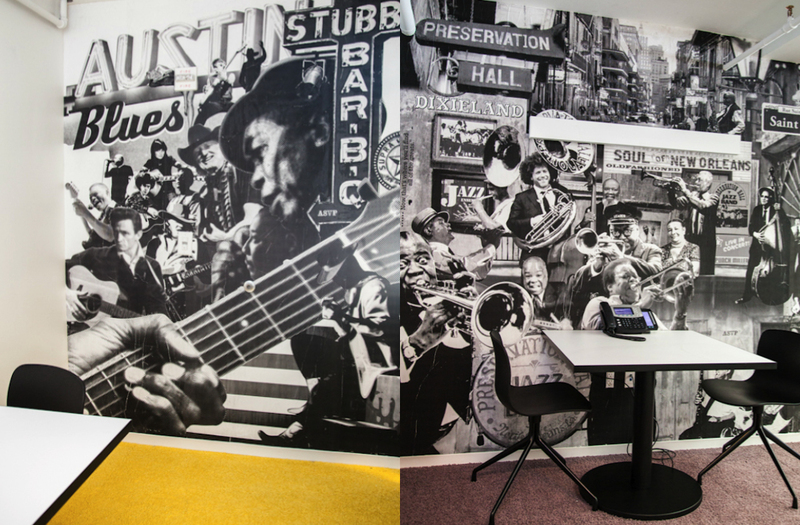 24 of the murals were designed based on music venue themed conference rooms. The largest mural featured ASVP original artwork with a prominent type treatment “The Making of a Classic.” This phrase was intended to give a nod to the recording industry while bringing together some of ASVP’s classic legacy imagery. Design and installation for this project was completed in 6 weeks. French design legend agnès b. noticed our work in the streets of Williamsburg, Brooklyn and reached out to us. We worked with her on a series of garments featuring ASVP images including a trench coat that was sold globally in agnés b., retail stores. In addition we were asked to curate the Public Display no. 1 show at the Howard Street Gallery in NYC. French design legend agnès b. noticed our work in the streets of Williamsburg, Brooklyn and reached out to us. We worked with her on a series of garments featuring ASVP images including a trench coat that was sold globally in agnés b., retail stores. 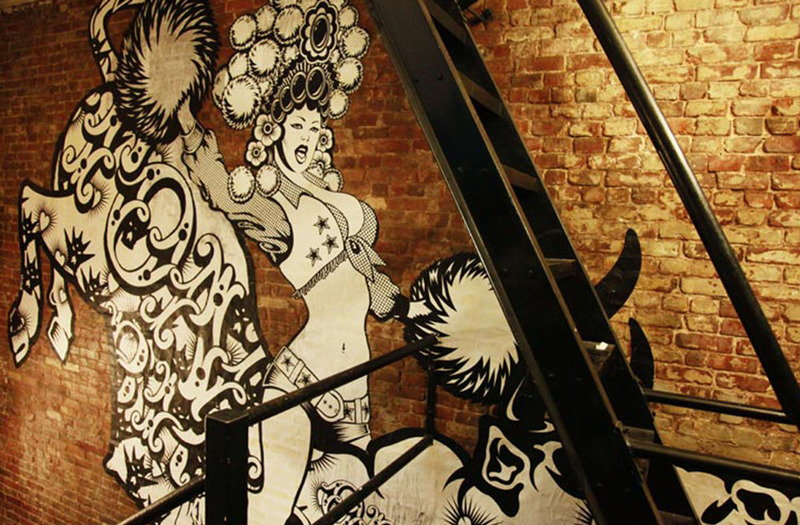 In addition we were asked to curate a Street Art show at her Howard Street Gallery in NYC.